Lawmakers across the country are introducing bills to legalize medical or recreational cannabis at the state level this year, galvanizing marijuana advocacy groups and sparking hopes that the industry is poised for yet another expansion. Twelve states have passed legalization measures over the past four years, and the chances are high at least one – and possibly more – will go that route in the coming months. In fact, 2015 could turn out to be a fairly significant year, with momentum from the cannabis victories in November and more mainstream acceptance of marijuana bolstering legalization efforts. It will fall in the hands of lawmakers: 2015 is not an election year, so state legislatures will have to authorize legalization. Lawmakers have already introduced bills in eight states to legalize and tax recreational cannabis and another 10 state legislatures are expected to consider similar bills, according to MPP. In addition, another dozen medical marijuana bills have been introduced in state legislatures, and more measures are expected in another six states. Count it all up, and that’s three dozen legalization measures. If even a handful of them pass, the industry will benefit from new business opportunities and hundreds of millions in potential new revenue. Here’s a look at the states that MPP thinks have the greatest chances of pushing through legalization this year (see the end of this article for a list of all the other states considering legalization). Though a bill has not yet been introduced in Rhode Island, Capecchi puts the state at the top of his list in terms of recreational marijuana legalization in 2015. Capecchi said this year’s measure will likely have “the same basic structure” of one that failed in 2014. If the bill passes as written when introduced, it’ll allow the existing three MMJ dispensaries in the state to get first crack at recreational sales before other entrepreneurs are allowed to apply for business licenses. Still, one question mark is Democratic Gov. Gina Raimondo, who has not taken a position yet on rec legalization. Vermont also has a good shot at pushing through rec marijuana, and a bill to do just that was introduced on Tuesday. The measure would allow those 21 and older to possess up to an ounce of cannabis, along with up to nine plants for personal cultivation. Non-residents would be limited to purchasing a quarter of an ounce at a time. The measure would authorize a minimum of four rec retailers throughout the state, but doesn’t specify a maximum. Several legislators and stakeholders recently took a fact-finding trip to Colorado, where they researched the implementation and effects of the country’s first legal rec industry. The trip was spawned by the expectation that a legalization effort in Vermont this year will have some serious political pull, and several officials wanted to learn first-hand what works and what doesn’t in Colorado when it comes to rec. The other major cog in the wheel is that Gov. Peter Shumlin has already come out in favor of legalizing rec, though he was cautious in his support and said his state should learn from the experiences of both Colorado and Washington State. Another factor at play in Vermont is a recent study that found that rec could be a financial windfall for the state, possibly bringing in anywhere from $20 million to $75 million a year in revenue. Coming quickly on the heels of last year’s near-victory, MMJ proponents were crowing in January after a Republican state senator introduced a bill to expand the state’s medical cannabis program. Backers of Amendment 2 in 2014, which narrowly failed to get the requisite 60% support at the ballot, called the new bill a “very good start” to approving a broader MMJ program in Florida. But the measure, filed in the state Senate, already has a competitor in the state House of Representatives that has narrower parameters. For example, it doesn’t permit smokable MMJ and also doesn’t allow for as many qualifying medical ailments. Still, Capecchi said he “wouldn’t be surprised” if the Florida Legislature passes one bill or another, partially because many politicos in the state would rather avoid another ballot measure in 2016. Another consideration is if the Legislature fails to pass a measure that satisfies Orlando trial attorney John Morgan, who bankrolled much of the Amendment 2 campaign last year, another multimillion-dollar political fight to legalize MMJ is a virtual certainty. Another major MMJ market that could enter the cannabis fold this year is Pennsylvania, where legislators have been attempting for years to approve a medical marijuana law. The main difference in 2015? The state has a new governor, Tom Wolf, who in January came out in support of passing a MMJ program. A measure with 25 co-sponsors has already been introduced in the Pennsylvania Senate, and though last year’s attempt died in the House after passing the Senate easily, this year could very well be different. That’s due in large part to a change in leadership in the House, to pro-MMJ Republican Rep. Dave Reed. The 2015 measure will also not be nearly as restrictive as last year’s bill, which prohibited smokable MMJ and only permitted cannabis-based oils, tinctures, edibles and pills. But the measure has yet to be altered to reflect those changes, though one of the bill’s prime sponsors says formal amendments are on the way. Other areas of the country could legalize MMJ or recreational cannabis this year as well. 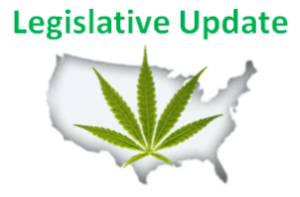 States that have rec bills on the table – or are expected to soon – include Alabama, Arizona, Connecticut, Florida, Hawaii, Illinois, Maine, Maryland, Massachusetts, Missouri, Nevada, New Jersey, New Mexico, New York, Pennsylvania, Texas and Wisconsin. On the MMJ legalization side, the list includes Georgia, Indiana, Iowa, Kansas, Kentucky, Mississippi, Missouri, Nebraska, North Carolina, North Dakota, Ohio, South Carolina, Tennessee, Texas, West Virginia and Wisconsin. Of course, the introduction of a bill is only the first step in the process, and many of these measures will likely fail. But it’s difficult to predict what will happen, so it’s plausible that some of these bills will be successful. The California legislature would be wise to legalize recreational cannabis in 2015, otherwise the citizens will do it in 2016, and the state will have no say in the details of the law. You forgot Illinois SB753 for recreational use. To be clear, the list at the end of the story was based on a summary from Marijuana Policy Project, and doesn’t include every single bill that relates to marijuana. To the best of my knowledge, there are no bills yet in California, Michigan or Mississippi to legalize recreational marijuana. If those legislatures do have bills introduced, please let me know, along with a bill number, and I’ll update the list. Mr. McKelvey- you were correct, but the reason that bill was left off of MPP’s list (I’m guessing) is because it only legalizes possession, and not sale and taxation of rec cannabis. But I added Illinois to the list anyway. Thank you for pointing that out. Do Not Legalize it, DeCriminal It. Legalizing it means 100% Government control from the seed to growing, distributing, selling, how, when and where you smoke or eat it. It’s been a year and just look, there’s 24 states that’s medical or the smarter states that’s legalized recreational. This actually hurts to say because it’s the state that’s got so much to offer. I was born and raised in Indianapolis, Indiana. The part that hurts to even say is being born and raised in a state that we all know as either the Indy 500, or the home of the “Super Bowl winning” ,Indianapolis Colts. The destination of a beautiful state that offers so much, are we going to be 1 of the dumbest states that keep saying “We Need More Research, so let’s turn down the bill”! As I read the newspaper, and watch the news in our great state it’s just getting away from what our Payton Manning winning super bowl champs made this state finally realize. We stand up STRONG for something we believe in & want. It’s been over a year since they said “NO, TO ALL OF US THAT SAID ‘YES’! Research has already proven that we are letting the person we voted for tell this great state we don’t need all the new great jobs,businesses, revenue, etc. This person is also telling us that it’s not legal to be prescribed 1 of the greatest gifts GOD gave us! This is were this Indiana State is READY TO STAND UP STRONG!! WE BELIEVE IT’S TIME INDIANA!!! We’ve ALL been touched by this VERY IMPORTANT THIS LAW HAS GOT TO BE OVER TURNED NOW, IF WE ALL HAVE GOT TO THROW ON OUR BLUE & WHITE JERSEYS AND PAINT OUR FACES! WE ARE SO STRONG TOGETHER AS WE’VE PROVEN! I just lost one of my very best friends to stage 4 cancer. I’ve not yet actually let it set in that my best friend of 28 years is gone! He got NO RELIEF AT ALL, BECAUSE OF A FUC### MAN THAT DOESNT CARE! ITS ONLY OBVIOUS THAT THESE STATES THAT ARENT YET LEGALIZED, THESE BIG PHARMACEUTICAL COMPANIES ARE PUTTING MILLIONS IN THIS PERSON’S UNTRACEABLE OFF-SHORE ACCOUNT! What does he care? He doesn’t gotta face watching a dear friend, or close family member in so much pain they can’t even eat! He was only 45 years old, we cant keep our family, friends from NOT being able to have the plant that GOD made for us ALL! I believe EVERY state should BE LEGALIZED if our country is AS UNITED, as we claim to be! COME ON INDIANAPOLIS,IN!!! ITS TIME TO COME TOGETHER AND MAKE THIS WAY OVER DUE LAW ‘VANISH’!! THE LONGER WE LET HIM TELL US ‘NO’, THE MORE STOCKS OF MMJ & MILLIONS & MILLIONS OF DOLLARS GO INTO THERE POCKETS FROM KEEPING US DOWN AND ACTING AS A DUMB STATE!!! IF THE PRESIDENT OF THE UNITED STATES SAYS ITS NOT A LAW ANYMORE, EACH STATE CAN MAKE UP THERE MIND? WELL,,DUH!! JUST LOOK AT COLORADO, and THE OTHER 24 STATES NOW!! IF WE KEEP LETTING THIS MAN KEEP US DOWN WHILE HES GETTING FILTHY RICH BEYOND ANYONE OF OUR DREAMS!!! THERE WILL NOT BE A CHANCE FOR ALL THE GREAT & WONDERFUL DIFFERENT SMALL BUISNESSES AND OPPURTONITIES FOR THOSE WHO DESERVE IT!! ITS GODS MEDICAL MIRACLE SO WHOS TO SAY ITS NOT LEGAL?